Hunting down pangolins is terribly easy. All the poachers have to do is send trained sniffer dogs to track them. Once they sense a predator approaching, the pangolin curls up into a ball to present its harder outside shell to the dogs. By this time, the poachers walk up to the animal, pick it up and put it in a sack. For those who cannot afford sniffer dogs, the easier way is to use pungent-smelling pills that force the pangolins to come out of their holes. The bags that cover the holes simply trap the pangolins. According to Azad Jammu and Kashmir’s Wildlife Department official Sikandar Ali, the ease with which poachers trap this endangered species has led to a lucrative illegal trade. The Indian pangolin, leopard geckos and black and brown scorpions are the main victims of this brutal trend of hunting and poaching. The Indian pangolin is listed as an endangered species in the Convention of International Trade in Endangered Species of Wild Fauna and Flora list. That does little to prevent the traders and the poachers. Initially, it was just the chunggars [the slum dwellers] that hunted the pangolins, earning themselves anywhere between Rs 8,000 and Rs 12,000 for each catch. However, the price has tripled since then, and pangolins can fetch up to Rs 35,000. The price is now enticing enough for the villagers to join in with the chunggars in poaching the pangolins, decreasing its numbers at an alarming rate. The trade of pangolins is booming in the Punjab as well, because the chances of detection and prosecution are next to none. In worse case scenarios, those caught are charged with fines that they pay without much fuss considering the profit margins involved. Six out of a total of eight pangolin species are on the International Union for Conservation of Nature’s red list as endangered species. However, they are being poached at an alarming rate due to the high price that they fetch and the ease with which they are caught. Wildlife Protection Force deputy director Rana Shahbaz says that more than 40 people have been arrested for poaching pangolins. Their punishment? Meagre fines between Rs 10,000 and Rs 15,000; less than half of what they get from selling a single pangolin. 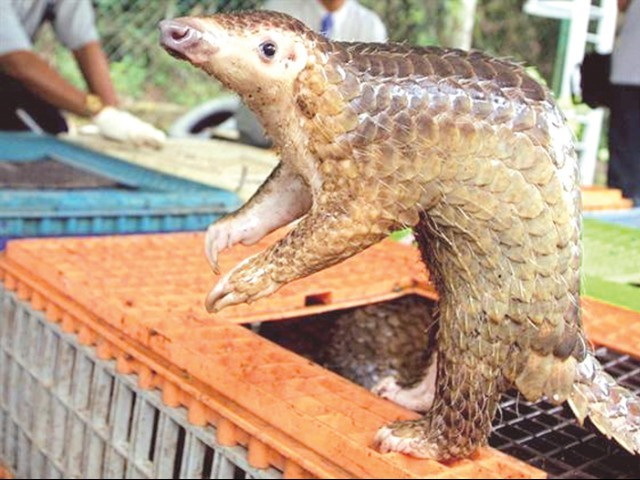 One of the people involved in the trade, Ghulam Ali, claimed that the demand for pangolins has increased and that its scales are used to manufacture bullet-proof jackets. Once caught, the pangolin is killed immediately; its trade is prohibited according to national and international laws and sneaking its scales and meat across borders is much easier than sneaking the animal alive. According to Ali, pangolins are not killed humanely, as the easiest way to separate the scales from the body is to dip the animal, alive, into a boiling cauldron of water. The scales are used in traditional Chinese medicines and pangolin meat fetches around $200 per pound. In April, a whopping 145kg of pangolin scales were confiscated by Customs officials at the Islamabad Airport from the luggage of two Chinese nationals who were on their way to Hong Kong.